In March of 2010, a powerful “nor’easter” affected the Northeastern United States and Eastern Canada. In the end, the storm resulted in at least nine deaths. This slow-moving storm produced over 10 inches of rain in the New England area and caused widespread flooding of urban and low-lying areas. Wind gusts up to 70 miles per hour snapped trees and power lines. Over 1 million homes and businesses were left without electricity. Maccaferri worked with a local contractor that was hired to repair some of the damage on a private residence and build a retaining structure for future protection. A gabion retaining wall was installed along the oceanfront property to protect upland infrastructure from recurring storm damage and wave action. The original wall design consisted of PVC coated galvanized steel wire woven mesh gabions, spanning 100’ parallel to the shore direction with a 9’ vertical height and two 30’ return walls at either end. 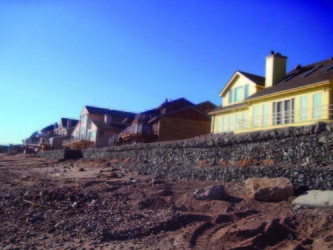 In October 2012, during Super Storm Sandy, the storm surge pushed a large volume of sand and debris upland against the existing wall. While minimal damage was observed in confined places, the wall structure remained intact and fully functional. Following the storm, the property owner utilized the same contractor to perform clean up and maintenance on the gabion wall system. While the original gabion structure performed as designed, providing protection to the upland infrastructure and foundation, the property owner elected to add to the existing gabion wall in addition to simple maintenance repairs. During the construction phase, the adjacent homeowner also elected to install a separate gabion wall fronting their property after seeing how well his neighbor’s wall held up during the storm. For the additional enhancements, an additional line of gabions were installed in front of the existing wall, widening its footprint so the wall’s overall height could be increased from 9’ to 12’. It was during this time that the wall was also extended in length to shield and protect the adjacent property. For more information about Maccaferri products please click here.